Barron's writes that "Hoppe's writings are like a laser beam. . . . Be prepared for arguments that push you beyond your limits." 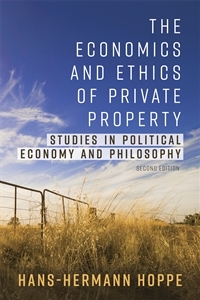 Hoppe carefully and consistently draws out the implications of property rights, and the state's violation of the private property order, for society and prosperity. The book is filled with insights that push the reader to imagine a fully free, private, and successful social and economic order. Chapter 8 Socialism: A Property or Knowledge Problem? Chapter 10 Is Research Based on Causal Scientific Principles Possible in the Social Sciences? The first treatise that put this thinker on the map.